Map of Clinton in Hunterdon County. Inset: Location of Hunterdon County highlighted in the State of New Jersey. A Census Bureau map of Clinton, New Jersey. Spruce Run State Park is in the Northwest corner of the map. Clinton is a town in Hunterdon County, New Jersey, United States, located on the South Branch of the Raritan River. As of the 2010 United States Census, the town's population was 2,719, reflecting an increase of 87 (+3.3%) from the 2,632 counted in the 2000 Census, which had in turn increased by 578 (+28.1%) from the 2,054 counted in the 1990 Census. Clinton was incorporated as a town by an act of the New Jersey Legislature on April 5, 1865, within portions of Clinton, Franklin and Union Townships. Clinton gained full independence from its three parent townships in 1895. Described by The New York Times in 1988 as having "conquered the worst residential radon hotspot known in the United States" which resulted from uranium in the limestone under sections of the town, Clinton and mayor-at-the-time Robert A. Nulman received state, national, and international attention for the town's successful efforts to combat the radon using ventilation systems in affected homes. Easter 2014 Photo by John Bohnel, depicting Main Street as seen from the cliff behind the Red Mill, which is visible in the bottom left corner. Many of the other visible buildings date back to the 1890s. According to the United States Census Bureau, the town had a total area of 1.417 square miles (3.670 km2), including 1.338 square miles (3.465 km2) of land and 0.079 square miles (0.205 km2) of water (5.59%). 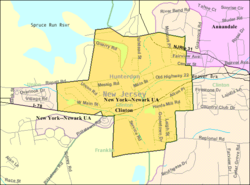 Clinton is considered an exurb of New York City, as Hunterdon County lies on the western fringe of the New York City Metropolitan Area, which is mainly rural with scattered housing developments and old farm homes. Clinton is part of the Primary Metropolitan Statistical Area of Middlesex, Somerset and Hunterdon counties in New Jersey. It serves as a "bedroom community" for many commuters working in and around Northern New Jersey and New York City, often younger residents who have supplanted long-time residents of Clinton. Source: <Flemington 5 NNW Weather Station= > FLEMINGTON 5 NNW Weather station (2009). "Clinton, NJ Weather". Clinton, NJ Weather Data. Open Publishing. Retrieved December 1, 2009. Clinton falls under the 'Northern New Jersey' climate zone. According to the Office of the New Jersey State Climatologist at Rutgers University, the Northern climate zone covers about one-quarter of New Jersey and consists mainly of elevated highlands and valleys which are part of the Appalachian Uplands. Surrounded by land, this region can be characterized as having a continental climate with minimal influence from the Atlantic Ocean, except when the winds contain an easterly component. Prevailing winds are from the southwest in summer and from the northwest in winter. Being in the northernmost portion of the state, and with small mountains up to 1,800 feet (550 m) in elevation, the Northern Zone normally exhibits a colder temperature regime than other climate regions of the State of New Jersey. This difference is most dramatic in winter when average temperatures in the Northern Zone can be more than ten degrees Fahrenheit cooler than in the Coastal Zone. Annual snowfall averages 40 to 50 inches (1,300 mm) in the northern zone as compared with an average of 10-15 inches in the extreme south. Clinton falls under the USDA 6b Plant Hardiness zone. As of the 2010 United States Census, there were 2,719 people, 1,057 households, and 727.216 families residing in the town. The population density was 2,032.6 per square mile (784.8/km2). There were 1,098 housing units at an average density of 820.8 per square mile (316.9/km2). The racial makeup of the town was 89.52% (2,434) White, 1.32% (36) Black or African American, 0.22% (6) Native American, 6.66% (181) Asian, 0.00% (0) Pacific Islander, 0.63% (17) from other races, and 1.66% (45) from two or more races. Hispanic or Latino of any race were 6.22% (169) of the population. There were 1,057 households out of which 37.0% had children under the age of 18 living with them, 55.2% were married couples living together, 9.7% had a female householder with no husband present, and 31.2% were non-families. 25.4% of all households were made up of individuals, and 8.8% had someone living alone who was 65 years of age or older. The average household size was 2.57 and the average family size was 3.14. In the town, the population was spread out with 26.0% under the age of 18, 6.1% from 18 to 24, 27.6% from 25 to 44, 28.8% from 45 to 64, and 11.5% who were 65 years of age or older. The median age was 39.6 years. For every 100 females there were 94.8 males. For every 100 females ages 18 and older there were 92.8 males. The Census Bureau's 2006-2010 American Community Survey showed that (in 2010 inflation-adjusted dollars) median household income was $83,850 (with a margin of error of +/- $12,019) and the median family income was $109,375 (+/- $19,698). Males had a median income of $62,697 (+/- $9,258) versus $67,014 (+/- $13,316) for females. The per capita income for the borough was $43,354 (+/- $4,395). About 2.6% of families and 3.2% of the population were below the poverty line, including 2.0% of those under age 18 and 11.9% of those age 65 or over. As of the 2000 United States Census there were 2,632 people, 1,068 households, and 724 families residing in the town. The population density was 1,916.0 people per square mile (741.8/km2). There were 1,095 housing units at an average density of 797.1 per square mile (308.6/km2). The racial makeup of the town was 92.06% White, 1.33% African American, 0.46% Native American, 3.72% Asian, 1.37% from other races, and 1.06% from two or more races. Hispanic or Latino of any race were 4.10% of the population. There were 1,068 households out of which 35.4% had children under the age of 18 living with them, 55.3% were married couples living together, 8.9% had a female householder with no husband present, and 32.2% were non-families. 26.3% of all households were made up of individuals and 7.1% had someone living alone who was 65 years of age or older. The average household size was 2.46 and the average family size was 3.00. In the town, the population was spread out with 26.4% under the age of 18, 4.7% from 18 to 24, 35.4% from 25 to 44, 24.2% from 45 to 64, and 9.4% who were 65 years of age or older. The median age was 37 years. For every 100 females, there were 95.3 males. For every 100 females age 18 and over, there were 92.3 males. The median income for a household in the town was $78,121, and the median income for a family was $88,671. Males had a median income of $61,442 versus $46,397 for females. The per capita income for the town was $37,463. About 0.4% of families and 2.8% of the population were below the poverty line, including 0.6% of those under age 18 and 1.6% of those age 65 or over. The Hunterdon Art Museum (7 Lower Center Street) is located in a mill established in 1836, and offers exhibitions of contemporary art, craft and design, docent tours and over 200 education programs for adults and children. Spruce Run Recreation Area (Van Syckel's Road, Clinton, NJ): 1,961 acres (7.94 km2), picnicking, boating, fishing and seasonal camping. Open year-round. Round Valley Recreation Area (Lebanon-Stanton Road, Lebanon, NJ) offers wilderness camping, beaches, trails, fishing and boating. Clinton is governed under the Town form of government with a mayor and a six-member Town Council. The Mayor is directly elected by the voters to a four-year term of office. Members of the Town Council are elected to three-year terms of office on a staggered basis, with two seats coming up for election each year in a three-year cycle. The governing body is chosen at-large in partisan elections held as part of the November general election. The primary responsibilities of the Council are to serve as the legislative body of the town, approve the annual budget presented by the Mayor, approve payment of bills and serve as Liaisons to several Boards and Committees. As of 2016[update], the mayor of Clinton Town is Democrat Janice Kovach, whose term of office ends on December 31, 2019. Members of the Clinton Town Council are Ken Carberry (R, 2017), Sherry Dineen (R, 2018), Marty Pendergast (R, 2017), Alfred D. Rylak (R, 2016; appointed in September 2013 to fill the vacancy of Megan Jones-Holt, who in turn had been appointed in February 2013 to fill the vacancy of Rich Duffy), Robert B. Smith (R, 2016) and Beth Sosidka (R, 2018). Clinton Fire Department (CFD) is located on the corner of New Street / Old Route 22 in Clinton. About 15% of the department's calls annually involve actual fire, while the rest of the CFD's calls are roughly broken down to 15% motor vehicle accidents, 15% hazardous conditions, 5% service calls, 25% good intent calls with no fire found and 25% alarm activations/false alarms, averaging about 190 calls annually. The department offers three types of membership namely Active firefighter, Junior firefighter and Associate membership to prospective members. The department runs mutual aid calls with Annandale Hose Company, High Bridge Fire Department, Quakertown Fire Company, Lebanon Fire Company and Pattenburg Fire Company and other fire departments in Hunterdon Country, which have become an invaluable resource for large incidents. The Division of Fire is a municipal fire department and is responsible for all fire related incidents in the Township. The personnel are provided by the all-volunteer Annandale Hose Company #1. There are two fire stations. One is located at 68 Beaver Avenue and the second is located at 1215 Route 31 South. Our apparatus consists of four engines, two command vehicles, one tower ladder, one tanker, and two brush trucks. The department covers an area of over 30 square miles and respond to around 500 incidents each year. The department has 45 active members who respond to calls. Each new member is trained to State Firefighter standards, and equipped to meet national standards. Our members put in hundreds of hours each year in classes, training and drills. They are always seeking volunteers not only for firefighting but also for other administrative duties. Clinton Town is located in the 7th Congressional District and is part of New Jersey's 23rd state legislative district. As of March 23, 2011, there were a total of 1,671 registered voters in Clinton, of which 439 (26.3%) were registered as Democrats, 529 (31.7%) were registered as Republicans and 700 (41.9%) were registered as Unaffiliated. There were 3 voters registered to other parties. In the 2012 presidential election, Republican Mitt Romney received 52.0% of the vote (693 cast), ahead of Democrat Barack Obama with 46.7% (623 votes), and other candidates with 1.3% (17 votes), among the 1,351 ballots cast by the town's 1,780 registered voters (18 ballots were spoiled), for a turnout of 75.9%. In the 2008 presidential election, Democrat Barack Obama received 49.4% of the vote (704 cast), ahead of Republican John McCain with 48.7% (694 votes) and other candidates with 1.2% (17 votes), among the 1,426 ballots cast by the town's 1,732 registered voters, for a turnout of 82.3%. In the 2004 presidential election, Republican George W. Bush received 54.8% of the vote (761 ballots cast), outpolling Democrat John Kerry with 44.0% (611 votes) and other candidates with 0.7% (12 votes), among the 1,389 ballots cast by the town's 1,671 registered voters, for a turnout percentage of 83.1. In the 2013 gubernatorial election, Republican Chris Christie received 69.2% of the vote (577 cast), ahead of Democrat Barbara Buono with 28.1% (234 votes), and other candidates with 2.8% (23 votes), among the 840 ballots cast by the town's 1,757 registered voters (6 ballots were spoiled), for a turnout of 47.8%. In the 2009 gubernatorial election, Republican Chris Christie received 60.5% of the vote (620 ballots cast), ahead of Democrat Jon Corzine with 27.7% (284 votes), Independent Chris Daggett with 9.5% (97 votes) and other candidates with 0.7% (7 votes), among the 1,025 ballots cast by the town's 1,711 registered voters, yielding a 59.9% turnout. Clinton-Glen Gardner School District is school district based in the Town of Clinton, that serves students from Clinton Town and Glen Gardner Borough in pre-kindergarten through eighth grade at Clinton Public School. Before Glen Gardner, a non-operating district, was consolidated into the district, students from the borough had attended the district's school as part of a sending/receiving relationship. Other students attend the school on a tuition basis. Formerly known as the Town of Clinton School District, the district's board of education voted in November 2009 to revise the name to Clinton-Glen Gardner School District to reflect the merger. As of the 2014-15 school year, the district and its one school had an enrollment of 711 students and 41.8 classroom teachers (on an FTE basis), for a student–teacher ratio of 17.0:1. Public school students in ninth through twelfth grades attend North Hunterdon High School in Annandale together with students from Bethlehem Township, Clinton Township, Franklin Township, Lebanon Borough and Union Township. As of the 2014-15 school year, the high school had an enrollment of 1,747 students and 134.8 classroom teachers (on an FTE basis), for a student–teacher ratio of 13.0:1. The school is part of the North Hunterdon-Voorhees Regional High School District, which also includes students from Califon, Glen Gardner, Hampton, High Bridge, Lebanon Township and Tewksbury Township, who attend Voorhees High School in Lebanon Township. As of July 2015[update], the town had a total of 12.21 miles (19.65 km) of roadways, of which 8.72 miles (14.03 km) were maintained by the municipality and 3.49 miles (5.62 km) by the New Jersey Department of Transportation. The most major road passing through Clinton is Interstate 78/U.S. Route 22, which run concurrently through the area. Direct access is provided by New Jersey Route 31 at Exit 17 and Route 173/County Road 513 at Exit 15. Route 173 and CR 513 run through the center of town, while Route 31 skims the northeast edge. Convenient access to Interstate 78 provides Clinton with a convenient route to and from New York City and the Lehigh Valley in Pennsylvania. Philadelphia can also be easily accessed from Clinton via New Jersey Route 31 to Interstate 295 nouth. Public transportation is very limited. The LINK, which serves Hunterdon County is the primary traditional publicly funded mode of transportation. Fares range from about $2.00 to $10.00. Funding for operation of the Hunterdon County LINK System is provided by Hunterdon County, NJ Transit and the Federal Transit Administration. Additionally, Warren County operates a shuttle along Route 31 Monday-Friday to Oxford Township. The town was featured on The Daily Show, which interviewed a local resident who was campaigning to have the town's name changed to Reagan after the Republican President of the United States Ronald Reagan, during the Clinton Administration. See also: Category:People from Clinton, New Jersey. John T. Bird (1829–1911), represented New Jersey's 3rd congressional district from 1869 to 1873. Gregg Cagno (born 1969), songwriter and touring performer in the singer/songwriter and folk genres. Anna Case (1888–1984), soprano who recorded with Thomas Edison. Kyp Malone (born 1973), multi-instrumentalist and member of the band TV on the Radio. Barbara McClintock (born 1955), children's book illustrator and author. Foster McGowan Voorhees (1856–1927), Governor of New Jersey from 1899 to 1902. Jessica Vosk (born 1983), Broadway actress who has starred as Elphaba in the Second National Tour of Wicked. South Branch Raritan river running through Clinton, New Jersey. Main Street of Clinton, New Jersey. Much of the area was redeveloped after a fire devastated the area on October 30, 1891. North Branch County Library at 65 Halstead Street in Clinton, NJ. It was built in 1999. Alley in Clinton, NJ. Named Allie's Way after a local teacher at Clinton Public School. ^ a b Mayor, Town of Clinton. Accessed September 2, 2013. ^ Town Clerk, Town of Clinton. Accessed July 8, 2016. ^ U.S. Geological Survey Geographic Names Information System: Town of Clinton, Geographic Names Information System. Accessed March 5, 2013. ^ a b c d e f DP-1 - Profile of General Population and Housing Characteristics: 2010 for Clinton town, Hunterdon County, New Jersey, United States Census Bureau. Accessed November 14, 2012. ^ a b c Profile of General Demographic Characteristics: 2010 for Clinton town, New Jersey Department of Labor and Workforce Development. Accessed November 14, 2012. ^ a b GCT-PH1 Population, Housing Units, Area, and Density: 2010 - State -- County Subdivision from the 2010 Census Summary File 1 for New Jersey, United States Census Bureau. Accessed November 14, 2012. ^ Look Up a ZIP Code for Clinton, NJ, United States Postal Service. Accessed November 14, 2012. ^ Zip Codes, State of New Jersey. Accessed September 2, 2013. ^ Area Code Lookup - NPA NXX for Clinton, NJ, Area-Codes.com. Accessed February 8, 2014. ^ A Cure for the Common Codes: New Jersey Archived 2004-11-10 at the Wayback Machine, Missouri Census Data Center. Accessed October 27, 2012. ^ Table 7. Population for the Counties and Municipalities in New Jersey: 1990, 2000 and 2010 Archived 2013-05-20 at the Wayback Machine, New Jersey Department of Labor and Workforce Development, February 2011. Accessed November 14, 2012. ^ The Town of Clinton. Hunterdon County, New Jersey. Accessed September 14, 2013. ^ Snyder, John P. The Story of New Jersey's Civil Boundaries: 1606-1968, Bureau of Geology and Topography; Trenton, New Jersey; 1969. p. 154. Accessed October 25, 2012. ^ The Red Mill: A Spin of the Wheel, The Red Mill Museum. Accessed July 21, 2011. ^ a b About the Museum, Hunterdon Art Museum. Accessed July 21, 2011. ^ Robert Hanley (September 15, 1988). "The Jersey Village That Fought Radon With Fans and Won". The New York Times. Retrieved 2018-01-01. Mayor Nulman cringes now while recalling TV and newspaper accounts in early 1986 that predicted mass evacuations and Clinton Knolls' reduction to a ghost town. ^ Congressional Record: Proceedings and Debates of the ... Congress. U.S. Government Printing Office. 1986. Retrieved 2018-01-01. McMahon commended Clinton Town Mayor Robert Nulman for responding to the radon problem in several homes in his community by dealing with the public in an 'informational rather than inflammatory way'. ^ Metropolitan Areas And Components, 1999, With FIPS Codes, United States Census Bureau. Accessed November 14, 2012. ^ Sclafani, Tony. "11:15 A.M.", Courier News, June 26, 2001. Accessed July 21, 2011. "Godown, 61, who just returned from a breakfast with Hunterdon County's police chiefs in Clinton, parks his cruiser beside the police department's door and steps inside the tiny, sparklingly clean headquarters.... It's very quiet Godown says about the borough where he's been chief for more than a decade He says many older residents have gone and been replaced by younger adults turning the 1squaremile town into more of a bedroom community." ^ ONJSC, Rutgers University. Accessed December 1, 2009. ^ Raum, John O. The History of New Jersey: From Its Earliest Settlement to the Present Time, Volume 1, p. 266, J. E. Potter and company, 1877. Accessed October 8, 2013. "Clinton township was formed from Lebanon in 1838. Its population in 1850 was 2,369; in 1860 including the village of Clinton 2,949; and in 1870, 3,134. This village was formerly called Hunt's Mills, from an early proprietor, in consequence of its valuable water power. It is beautifully diversified with hills, was incorporated as a borough in 1865, and contained in 1870, 785 inhabitants." ^ Staff. A compendium of the ninth census, 1870, p. 259. United States Census Bureau, 1872. Accessed October 8, 2013. ^ Porter, Robert Percival. Preliminary Results as Contained in the Eleventh Census Bulletins: Volume III - 51 to 75, p. 98. United States Census Bureau, 1890. Accessed November 13, 2012. ^ Thirteenth Census of the United States, 1910: Population by Counties and Minor Civil Divisions, 1910, 1900, 1890, United States Census Bureau, p. 337. Accessed November 13, 2012. ^ Fifteenth Census of the United States : 1930 - Population Volume I, United States Census Bureau, p. 716. Accessed November 13, 2012. ^ a b c d e Census 2000 Profiles of Demographic / Social / Economic / Housing Characteristics for Clinton town, New Jersey, United States Census Bureau. Accessed November 14, 2012. ^ a b c d e DP-1: Profile of General Demographic Characteristics: 2000 - Census 2000 Summary File 1 (SF 1) 100-Percent Data for Clinton town, Hunterdon County, New Jersey, United States Census Bureau. Accessed November 14, 2012. ^ DP03: Selected Economic Characteristics from the 2006-2010 American Community Survey 5-Year Estimates for Clinton town, Hunterdon County, New Jersey, United States Census Bureau. Accessed November 14, 2012. ^ Office Locations, Foster Wheeler. Accessed November 14, 2012. ^ About the Museum Village, The Red Mill. Accessed December 2, 2006. ^ Landsdown Trail, Hunterdon County, New Jersey Department of Parks and Recreation. Accessed July 21, 2011. ^ Spruce Run Recreation Area, New Jersey Department of Environmental Protection. Accessed July 21, 2011. ^ Round Valley Recreation Area, New Jersey Department of Environmental Protection Division of Parks and Forestry. Accessed November 14, 2012. ^ Kiriluk-Hill, Renée. "New Clinton Mayor Janice Kovach is sworn in by state Sen. Barbara Buono", Hunterdon County Democrat, January 4, 2012. Accessed September 14, 2013. "Janice Kovach, a Democrat, was sworn into a four-year term as mayor at a standing-room-only Town Council reorganization meeting on Monday, Jan. 2." ^ Town Council, Town of Clinton. Accessed July 8, 2016. ^ 2016 Municipal User Friendly Budget, Town of Clinton. Accessed July 8, 2016. ^ 2017 County and Municipal Directory, Hunterdon County, New Jersey. Accessed August 9, 2017. ^ Town of Clinton, Hunterdon County, New Jersey. Accessed July 7, 2016. ^ Home page, Clinton Fire Department. Accessed July 21, 2011. ^ Mutual Aid, Clinton Fire Department. Accessed July 21, 2011. ^ Fire, Clinton, New Jersey. Accessed February 26, 2014. ^ Voter Registration Summary - Hunterdon, New Jersey Department of State Division of Elections, March 23, 2011. Accessed November 14, 2012. ^ 2008 Presidential General Election Results: Hunterdon County, New Jersey Department of State Division of Elections, December 23, 2008. Accessed November 14, 2012. ^ 2004 Presidential Election: Hunterdon County, New Jersey Department of State Division of Elections, December 13, 2004. Accessed November 14, 2012. ^ 2009 Governor: Hunterdon County, New Jersey Department of State Division of Elections, December 31, 2009. Accessed November 14, 2012. ^ Clinton Town School 2013 Report Card Narrative, New Jersey Department of Education. Accessed July 8, 2016. "Clinton Public School is a pre-kindergarten through Grade Eight school located in the historic Town of Clinton in Hunterdon County. The school serves approximately 500 students from the Town of Clinton and the Borough of Glen Gardner." ^ Letter dated November 30, 2009, Clinton Public School. Accessed May 23, 2013. "Previously named the Town of Clinton Board of Education and Town of Clinton School District, the passing of the by-law changed the names to be The Clinton-Glen Gardner Board of Education and The Clinton-Glen Gardner School District.... This change occurred as a result of the State government's June 30, 2009 passing of PL 2009 c. 78 which required the elimination of non-operating school districts and the creation of a merged district between the non-operating and receiving school." ^ District information for Clinton-Glen Gardner School District, National Center for Education Statistics. Accessed December 7, 2016. ^ About the North Hunterdon-Voorhees Regional High School District, North Hunterdon-Voorhees Regional High School District. Accessed February 15, 2015. "North Hunterdon High School educates students from: Bethlehem Township, Clinton Town, Clinton Township, Franklin Township, Lebanon Borough, Union Township; Voorhees High School educates students from: Califon, Glen Gardner, Hampton, High Bridge, Lebanon Township, Tewksbury Township"
^ Information Regarding Choice of District School, North Hunterdon-Voorhees Regional High School District. Accessed February 15, 2015. "In the past, parents and students of the North Hunterdon High School sending districts were able to select either North Hunterdon High School or Voorhees High School as their school of choice.... As our student population continued to grow and our two high schools reached, and exceeded, 90% capacity, the option of choosing Voorhees was eliminated in the 2005-2006 school year for the North Hunterdon sending districts (Bethlehem Township, Clinton Township, Franklin Township, Lebanon Borough and Union Township – Clinton Town students still have choice as they are classmates at Clinton Public School with Glen Gardner students, who attend Voorhees)." ^ About the District North Hunterdoon-Voorhees Regional High School District. Accessed February 15, 2015. "North Hunterdon High School educates students from: Bethlehem Township, Clinton Town, Clinton Township, Franklin Township, Lebanon Borough, Union Township; Voorhees High School educates students from: Califon, Glen Gardner, Hampton, High Bridge, Lebanon Township, Tewksbury Township"
^ School data for North Hunterdon High School, National Center for Education Statistics. Accessed December 12, 2016. ^ Voorhees High School 2015 Report Card Narrative, New Jersey Department of Education. Accessed June 3, 2016. "Voorhees High School has consistently ranked among the top high schools in New Jersey and was named a National Blue Ribbon School in 2015. With an enrollment of 1,095 students in grades 9-12, the school serves the communities of Califon, Glen Gardner, Hampton, High Bridge, Lebanon Township, and Tewksbury Township." ^ Public School Directory 2015-2016, p. 55. Hunterdon County Department of Education. Accessed June 3, 2016. ^ About the North Hunterdon-Voorhees Regional High School District, North Hunterdon-Voorhees Regional High School District, updated November 16, 2015. Accessed June 3, 2016. "North Hunterdon High School educates students from: Bethlehem Township, Clinton Town, Clinton Township, Franklin Township, Lebanon Borough, Union Township; Voorhees High School educates students from: Califon, Glen Gardner, Hampton, High Bridge, Lebanon Township, Tewksbury Township"
^ Hunterdon County Mileage by Municipality and Jurisdiction, New Jersey Department of Transportation, July 2015. Accessed November 25, 2015. ^ Schedule From Allentown/Easton/NJ to New York, Trans-Bridge Lines. Accessed July 21, 2011. ^ Hunterdon County Bus/Rail Connections, NJ Transit, backed up by the Internet Archive as of May 22, 2009. Accessed July 21, 2011. ^ Raritan Valley Line, NJ Transit. Accessed October 8, 2013. ^ LINK Hunterdon County Transportation, Hunterdon County Transportation. Accessed December 1, 2009. ^ 31 Ride, Warren County, New Jersey. Accessed December 30, 2017. ^ Staff. "Clinton a draw for filmmakers", New Jersey Hills, August 11, 2004. Accessed December 30, 2017. "It's one of the opening scenes from Turbulence, a 1997 film where Ray Liotta is the serial murderer described above.... Other movies that were partly filmed in Clinton included One True Thing (1998), starring Meryl Streep who portrayed a family struggling to come together after their mother is diagnosed with cancer. Another film was In & Out (1997), a comedy starring Kevin Kline that used Clinton as the town where Kline's character is a high school English teacher." ^ Slusher, Jon. "Clinton Towne Restaurant celebrates 30th anniversary", Hunterdon Review, June 4, 2009. Accessed September 2, 2013. "Last year, the soap opera As the World Turns filmed in downtown Clinton and used a section of the restaurant as an area for the actors to get dressed and put on their make-up." ^ Anna Case House - 15 East Main Street, Town of Clinton. accessed July 13, 2018. "Anna Case, who became an outstanding opera singer was born at 15 East Main Street, on October 29, 1889." ^ Jordan, Chris. "Let It Rain; Kyp Malone's solo project tackles some, tough issues", Courier News, February 4, 2011. Accessed June 29, 2018. "Speaking of returns, Malone is a frequent visitor to Hunterdon County, mostly Frenchtown these days. He spent his teen years in Clinton and graduated from North Hunterdon High School in 1991." ^ About, BarbaraMcClintockBooks.com. Accessed October 16, 2017. "I was born and spent the first part of my growing up in Clinton, NJ." ^ Proctor, Owen. "Nutley native Sharon Van Etten releases third album, gets national attention", The Nutley Sun, July 9, 2012. Accessed June 19, 2014. "Like her parents, the Nutley community was supportive of her early music education, she said. Her family later moved to Clinton." ^ New Jersey Governor Foster McGowan Voorhees, National Governors Association. Accessed August 27, 2013. ^ Pennington, Juliet. "The VIP Lounge with Jessica Vosk", The Boston Globe, June 23, 2017. Accessed October 10, 2017. "The Clinton, N.J., native, now calls West New York, N.J., home. Vosk, 33, who plays Elphaba (the role made popular by Idina Menzel), said she is enjoying spending time in Boston, where her younger brother, musician Daniel Vosk, went to school." Wikimedia Commons has media related to Clinton, New Jersey. Wikivoyage has a travel guide for Clinton (Connecticut).